Light and delicious, this spaghetti dish puts a fresh, herb-infused twist on a classic. 1. Cook spaghetti according to packet. 2. 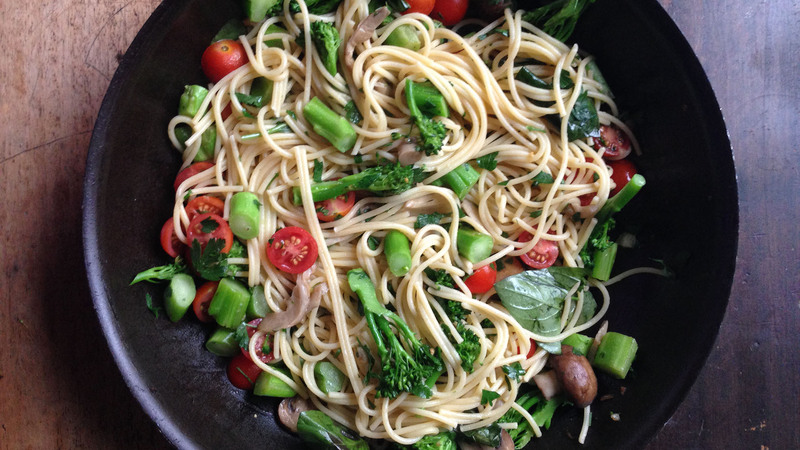 While spaghetti is cooking, finely chop garlic, slice mushrooms and broccolini. 3. In a pan heat olive oil on medium heat. Fry garlic, mushroom and broccolini until just cooked (approximately five minutes). You want to retain the crunch! 4. Cut tomatoes in half, roughly chop parsley and tear basil. 5. Once spaghetti is cooked, drain and add to pan, reducing heat to low. 6. Add remaining ingredients- tomatoes, parsley, basil, salt and pepper and more olive oil if needed.